A great sculpture by american artist Kurt Larisch. It is stainless on marble base. Signed and numbered on the metal. Tall abstract bronze sculpture on rectangular stone base, French, 1970s. Walnut abstract sculpture with a chip carved design. Mahogany base. Unsigned. 1960s. 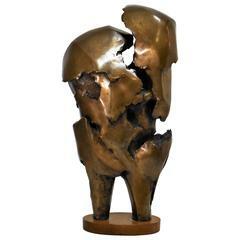 1960s abstract solid bronze sculpture signed by Spanish artist Ana María Nieves representing Jesus Christ on a Nero Portoro marble base. Base dimensions: 8 x 25 x 25 cm. For your consideration a beautiful surrealist bronze head sculpture with birds. Mexico, 1960s. Unknown artist. Measures: 11" H x 13" D x 7" W.